This 5 1/2 hour DVD comes in two parts for the best quality. You will received two DVD's. 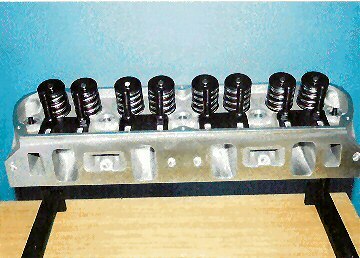 This two part production is a step-by-step / hands on treatment of building a super high performance 351-W Ford engine. This production is also part of a series of DVD's from Nitrousfueler, " Wayne E Partridge Sr " . Partridge Sr. is an engine builder / fuel dragster owner / sprint car owner with a video production company. Mr. Partridge starts with a stock D2AE or 72 year engine block, and builds on a multi-camera set, a 410 CID / 700 HP small block Ford killer engine. He uses all the best parts and components to build the finest 351 ever built. He takes you to the machine shop and lets you see the block being bored, decked, align honed and then takes the crank, rods and pistons to another machine shop and you watch them balance and the rotating assembly and explain the complete process. Then step-by-step takes the King racing engine bearings and shows you how to check the clearances and install them. 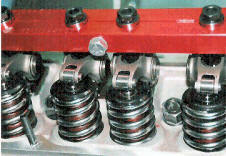 You will see and install a 4340 Eagle light weight crank that has Chevy rod journals and bearings. He installs a set of GRP aluminum rods to show you how the aluminum rods look and install, then removes them and installs a set of Oliver 6.200 long Chevy rods with JE Pistons and rings. You watch him hand grind the rings and install them on the pistons, and into the engine. You will learn how to pre-check your engines parts and components before assembly. He installs ARP main studs and a main stud girdle. He then takes you through the Comp Cams installation and installs a beautiful 700 lift solid roller cam and lifters. You will see the cam up close and in detail. You will learn how to degree your cam, how to read a cam card and know what duraration is. 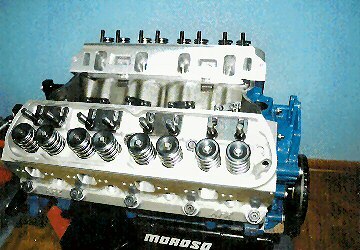 He show how advancing your cam looses top end horse power and retarding increases the top end and takes from the bottom. He will install the timing chain assembly and show the importance of the right keyways. He shows how to install the front damper along with the front cover to align the front cover correctly. 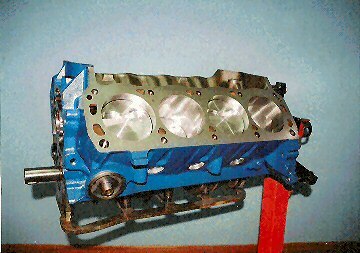 A big problem with small block Fords. You will see an ATI Super Damper and understand how they work. He shows you gaskets and sealers. 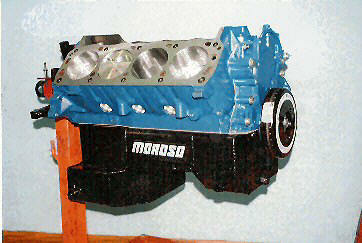 He will install a Fox body Moroso 8 quart racing oil pan. He shows you how to install a new oil pump but then blocks it off and installs a Moroso external oil pump. He shows you AFR Air Flow Research 205 Aluminum racing heads, valves, springs, retainer and stem seals. They flow 310 CFM at 700 lift. You will see how nice these heads are inside and out. He shows how they all fit together and shows you how to set the installed height using shims and seats. You will watch the height mic dial out to the spring height and watch how to correct the spring height. He shows you a new tool from Moroso that will install the valve springs much easier than the old standard way. You will watch as Partridge installs the Fel-Pro head gasket and torques the the AIR racing head down. How to check piston to valve clearance with instruments and play putty. 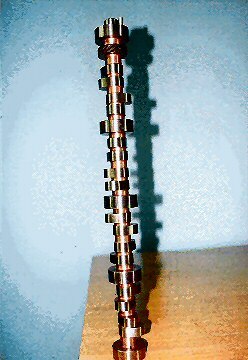 He then shows you Comp Cams awesome Stainless Steel roller rockers and a stud girdle. You will watch every step of the build up process. Many close up shots and he will explain that the Comp Cams Stainless roller rocker is much stronger than a aluminum rocker and are lighter. He shows you how to find pushrod length, adjust and set valve lash. He installs Moroso aluminum valve covers, Edelbrocks Super Victor intake manifold for the 351-W and it is quite the manifold. 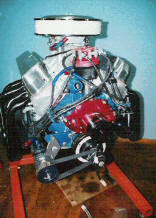 He installs a Demon 4150 style 825 Carburetor that flows 975 CFMs. You see all parts and components up close and in great detail. Mr. Partridge installs a complete MSD ignition system with a Digital 6 Plus controller box. He shows you the CSR electric water pump and gear reduced racing starter. He then shows you the Ron Davis aluminum radiator with twin fans. Mr. Partridge will use all these parts and components in his newest 82 Mustang Fox body drag car. How to check all rod and crank clearances with instruments and with a simple small strip of plastic. Mr. Partridge then takes the complete engine and installs it onto an engine test stand with the MSD ignition, Barry Grant pumps and filters, Jaz fuel cell, Moroso external 2 qt. oil filter, Auto Meter tach, oil and temp gauges. He shows you all the support parts and components and tell how they work to make the engine run. 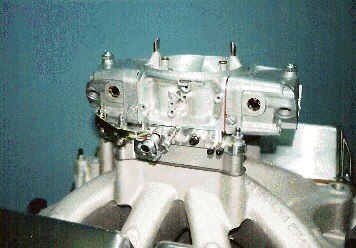 Then the 410 CID Ford Small Block engine is started and you watch it run on the test stand. You see the oil pressure, the temp and tach rpm. You watch the gasoline flow through the lines, filter, pump, regulator and see the fuel pressures. You watch the engine warm up to near 180 and he turns the fans on and the radiator with the fans brings the temp down 5 degrees in 10 seconds. You will hear the engine you watched being build step-by-step run and rev up. Hear the Scheonfeld headers and roller cam. 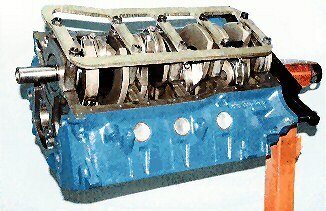 The 351-W was bored 40 over, 4 inch stroke crank, 6.200 rod with the right piston makes 13 to one compression ratio with 410 CID.